Etude House Spring Collection 2014 - Color Lips Fit | Memorable Days : Beauty Blog - Korean Beauty, European, American Product Reviews. First of all, HAPPY LUNAR NEW YEAR Everybody ^^! I hope y'll will have an awesome, happy and healthy year! 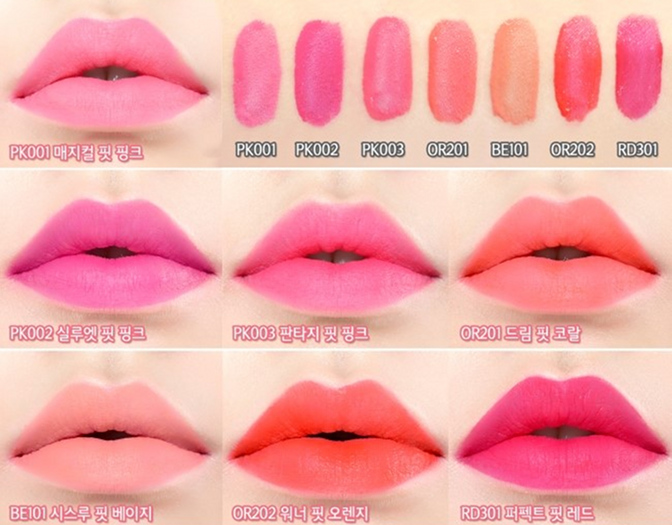 Today I would like to show you the latest product of Etude House - the Color Lips-Fit which is a part of their Spring Collection 2014. I can't wait until their new collection is out! These lovely color lips fit lipsticks are described as being soft, silky, non-sticky with an airy texture that provides vivid colour pigmentation. It comes in 7 colours and one clear gloss. The gloss contains vitamin E and can be used as a base and top coat. So far you can only buy it at beautynetkorea.com for $8.91 each (link to product) or you can purchase it on their Ebay page from seller f2plus1 for $9.90 (link to product) including worldwide free shipping. By looking at the pictures, the finish looks pretty matte. 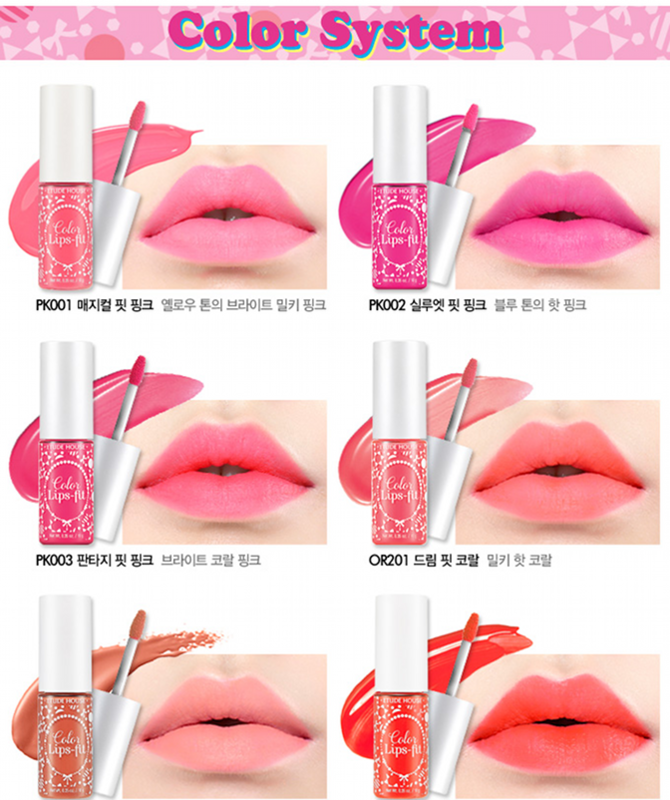 I'm curious if it's drying though but luckily they also released a gloss for people with dry lips. You can use the gloss as a base and/or as a top coat. It has a lovely glossy finish as well. Scroll down if you want to know how to use it. Make sure to check out the video below for swatches, you will get a better view of the colors and the packaging of this product. I'm actually more excited about this product after watching this video hahaha. It looks glossy when it's wet, but when it's dry it has a matte finish. 1. Shake well before you use the lipsticks. It includes a small ball inside so you can mix the formula easier. 2. Apply the product with the tip and spread well. You can apply it on the center of your lips to create the gradient effect or apply a full cover. 3. If you want to have a glossy look. Wait for 60 seconds before you apply the translucent gloss. I'm not completely blown away yet, but the shades are perfect for Spring and i'm curious what they will release more. 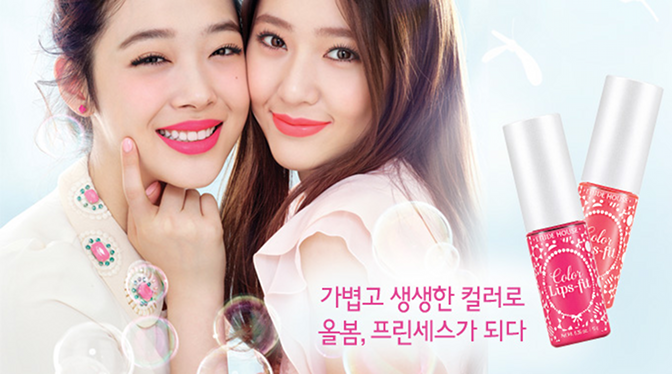 Anyhow, the color lips fit looks amazing on Sulli and Krystal ^_^. WHAT DO YOU THINK? WHICH SHADE IS YOUR FAVOURITE?